A new type of perovskite, the first-ever magnetic photoconductor, could lead the way to the next generation of data storage devices, according to its discoverers at the Ecole Polytechnique Federale de Lausanne in Switzerland. The material is a modified form of perovskite, a mineral of great interest to developers of solar cells. A ferromagnetic photovoltaic material, its magnetic properties can be changed reversibly by heating. The EPFL researchers, led by post-doc Bálint Náfrádi, developed the organometallic substance, which contains manganese and lead, and in a paper in the journal Nature Communications they explain that it combines the properties of ferromagnetism, where structures that give rise to magnetism are aligned in a well-defined order, and photoconductivity, where shining light on the material generates free-moving electrons within its structure. The combination of these two properties means that light frees electrons, which effectively “melt” magnetic structures inside the crystal. This can be achieved with a simple red LED, much weaker even than a laser pointer. The timescale for this transformation is a order of femtoseconds. Although very much in the experimental state, these materials could, according to Náfrádi, be the basis for low-energy, high-capacity memory storage systems. 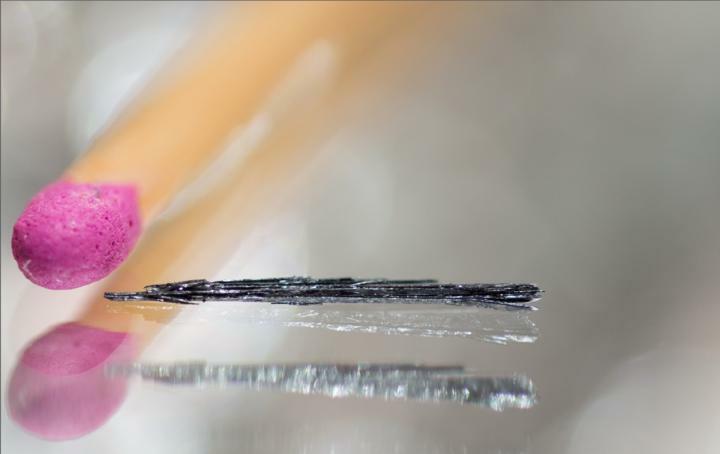 ” These would combine the advantages of magnetic storage – long-term stability, high data density, nonvolatile operation and rewritability – with the speed of optical reading and writing,” he said.